Info on all the new incubators and related initiatives from the February Conflab event. On Tuesday the 28th February, we conducted the second in our series of Digital Policy ‘Conflabs’. The purpose of these conflabs is to bring people together to explore and discuss issues of relevance to the digital tech community in Sheffield, and to provide a forum for the community to openly engage with policy-makers, organisations and institutions that are shaping the ecosystem, in a ‘semi-formal’ setting. 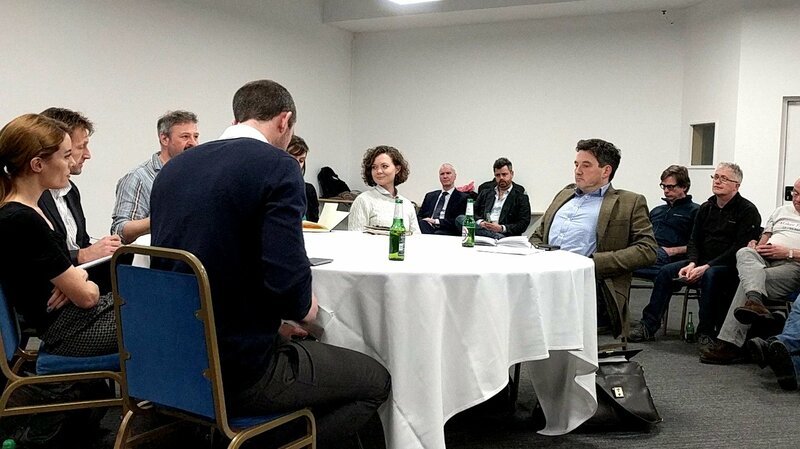 The February event, very helpfully supported by Creative Sheffield, was sub-titled “Spatio-sectoral planning”, and brought together people who are currently involved in setting up, or planning, new digital technology hubs in the city in a ‘public round table’ – as you can see from the photo, this consisted of a central discussion table surrounded by a public audience who could ask questions and participate in the discussion. This ‘formal’ setup was used for the main debate, followed by beer, pizza and informal discussion and networking afterwards – hence the ‘semi-formal’ setting. Prior to the event a briefing paper was circulated amongst all the attendees, which you can read here. 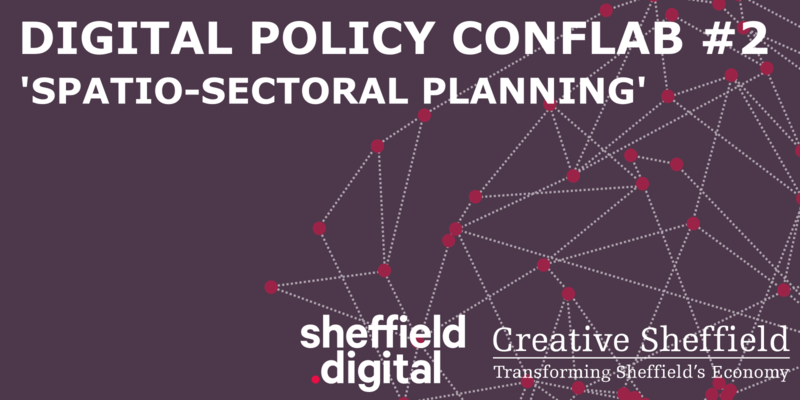 The intended outcomes of the event were simply for people to meet each other and begin to collectively understand the broad picture of what’s going on in Sheffield with regard to incubation spaces ​and support ​for the creative and digital technology industries. The Q&A part of the discussion was held under Chatham House rules, and of course some of the round-table participants were restricted by commercial sensitivities, as their projects are still in planning and development, but generally the discussion was very open and friendly, and consequently illuminating and useful. Certainly from the feedback I’ve had since, that seems to have been the experience of those who came along. 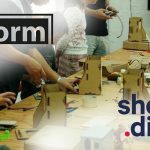 This summary forms the main formal output of the event – and is made available for those who couldn’t be there on the day, and the wider creative and tech community in the city. Here is a summary of the projects represented by each of the round-table participants, with clarifications resulting from the Q&A incorporated. They are presented in the order in which the participants held the floor, which was determined by where they happened to sit around the table – there was no intentional seating plan. SMEC, which is the charity that runs the Showroom Workstation complex, has recently submitted an application to the Arts Council for funding to develop a digital creativity hub in the Mezzanine space at the Workstation. This hub will be creativity, art and ideas-led, similar in many ways to the well known Pervasive Media Studio in Bristol’s Watershed. This would be a three year contract, should the funding application be successful. The business plan is designed to provide a safe ideas-testing zone for creative people – there’s no specific remit and the hub would welcome artists, musicians, media makers and technologists alike. Anyone can use the space, and then apply for a bursary to develop an idea or prototype. It’s very much geared around the realisation of ideas, rather than commercialisation, although commercialisation can follow. The funding decision will be made in July, and would see the hub open from April 2018. Should the funding application prove unsuccessful, SMEC would be prevented from re-applying to the Arts Council for 3 years, however there are alternative sources of funding both public and private that would be looked at, as SMEC sees this as an important initiative and will continue to pursue its realisation. In addition, the temporary and project-focussed nature of the hub will mean that it complements other creative centres, such as The RoCo. SMEC’s motivation for this hub is not to enhance their tenant pipeline, but see it as an opportunity for something quite unique in the city. In terms of who will engage with the hub, the hope is that it might attract a range of creative people, and potentially provide a way for some people to take a sabbatical from their day job, or freelancing gig, and experiment with an idea without too much financial risk. The Site Gallery is closing for a year in order to refurbish and expand the gallery into the building next door, and will reopen in 2018 three times the size it is now. However, this does not mean that the gallery’s activity will also halt for a year, as Site is embarking on a series of activities connected to the £750,000 Arts Council England funded City of Ideas project. As part of this, Site is expanding its offer with a participation team. There will be a programme of STEAM educational activities. STEAM stands for Science, Technology, Engineering, Art and Maths, combining these subjects into integrated learning experiences instead of teaching them separately. Site are also commissioning a van conversion, co-designed the gallery’s Young People team, which will provide a flexible and mobile training and education space which will go out into the community while the gallery is closed. In addition to this the labs (‘Site Sessions’) will avail themselves of other spaces in the city, (interested spaces are very welcome to get in touch). Leila is planning on hosting an activity roughly once a month, and the emphasis will be more on the art and curiosity side in order to provide something different and new. Firstly, the Kollider Project and the new Incubator at Castle House are really two separate things. The Kollider Project, as a whole, is a long term project with the intention of building out an ‘innovation district’ in the Castlegate area of the city, whatever that might entail. The incubators that follow from the Sheffield Digital Business Incubator award – and there are two currently planned – have a shorter lead time and are more specific, within the overarching Kollider Project. The first of these incubators is located at Castle House, and will provide 80,000 square feet of space for a mixture of cafes, retail, event space, maker facilities, etc. and there will be both visiting and permanent accelerators and incubators operating there. Contracts for all of this are still in the process of being agreed and signed, but are in the final stages, and once they are there will be a public launch that will explain the plans in more detail, and invite stakeholders in the city to bring ideas and suggestions for engaging with and expanding the planned activities. Essentially, the floors and floor-space have now been allocated to different functions within the building, and certainly large amounts of it will be for co-working, incubation and business support, but the specific activities will be developed as the project progresses. What is important to note is that there is a known deficiency in the local economy with regard to experimenting at the proof of concept stage, across all our key economic sectors, and this is something that both the incubators, and the wider Kollider Project are trying to address. This effort is not just about buildings and regeneration, therefore, but primarily about economics and ecosystem. Other digital incubation and innovation projects in the city are very much welcomed by Kollider, as they all add to the significance of the city’s ecosystem and help to attract external investment and partnerships. The second incubator, which is still in the early stages of planning, is to provide a stimulus for multi-media and digital content production in Sheffield, partly to boost economic activity in this area, but also to raise Sheffield’s visibility and profile on the back of it. MakerHub CIC tendered for the Digital Business Incubator funding, but lost out to Kollider Project, however the organisation has since reassessed its strategy and is now looking to deliver some of the programmatic activity that it crowd-sourced from the wider digital and tech community during 2016. They are currently engaged with a number of prospective partners, including Sheffield Hallam University as well as Barclays’ Eagle Labs, and have signed a memorandum of understanding with Accelerated Digital Ventures (ADV), which is a technology investment platform that is looking to support ‘curators’ within local digital ecosystems in key cities. MakerHub is a Community Interest Company, and will operate as a social enterprise, with a vision to build an asset that is owned by the community. Built into the fabric of MakerHub’s values is an implicit aim to make the opportunities afforded by tech available and accessible to all. Taking a lean approach, MakerHub intends to start with a programmatic focus on tech startup founders to provide a forum for peer-to-peer learning and mutual support. Alongside the programmatic activity, the organisation intends to foster community engagement and encourage local initiatives to support the ecosystem from the grassroots up. MakerHub CIC are currently evaluating programme and funding options to deliver some of these activities, and will commence this work in earnest from April. University of Sheffield Enterprise run very early stage co-working, incubation, business and commercialisation support for students, graduates and university alumni from the University’s Enterprise Zone space on Portobello Street. They provide small bursaries and free space for budding entrepreneurs while they develop their ideas. They have three on-site coaches, covering customer development & technology startups, business support and social enterprise. They provide 24 co-working hot desks as well as a small amount of more permanent incubation space, and are particularly interested in follow-on space for their entrepreneurs once they are ready to leave the Enterprise Zone. In addition, they run Startup Weekends several times each year to seed ideas and provide a pipeline of entrepreneurs for the programme. In addition, Sam is also a founder of Campus Capital, along with Michael Howe. Campus Capital is a new venture capital firm that is raising a fund of £2m from which it is looking to make investments of between £50k and £200k for early stage technology and science startups. It operates across the Sheffield and Manchester city regions in year one, and is looking to make nine deals in its 1st year. What is unique about Campus Capital is that is works in conjunction with universities – currently the University of Sheffield and the University of Manchester – to build teams of students who actively engage with the venture capital process on the investment side of the table. The firm has essentially two missions: on the one hand to provide the two city regions with local access to venture finance, and on the other to train up a new generation of investment managers who understand the venture capital business and can go on to apply their knowledge more widely to the benefit of local ecosystems. 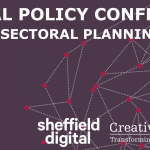 The lack of general venture investment expertise has been identified as a weakness locally in both Sheffield and Manchester city regions, and this will go some way towards addressing this gap. (This is not to say that Campus Capital students will be making any final investment decisions, but they will make early stage decisions and will therefore gain close insights.) It should also be noted that investments are open to all startups, not just those with university connections. The ‘campus’ term refers to the student investment training aspect of the business, the development of co-investment opportunities with knowledge and IP transfer functions at both institutions and the fact that some of the fund will be raised from university alumni. Sheffield Hallam University is now one of largest universities in the UK. Next year it will be 25 years old. This means that we are now looking to the future. With a new VC and new strategic plan, we are seeking to develop the university into the best applied university in the world. To this end, we are looking outwards to ensure that we are fully engaged with our community, especially locally. We are also seeking new ways to engage. So this also includes finding new opportunities for commercialisation and enterprise. A great example of what we currently do locally is the Venture Matrix scheme, that connects businesses with students. There are now over 5000 students investing their ideas and enthusiasm, as part of their curriculum, on projects that support local charities and businesses. Perhaps the country’s largest applied learning programme. However, we need to do more, especially around the digital agenda to support and develop local companies; support our brilliant graduates to remain in the city; and develop better knowledge transfer. Hallam has an abundance of talent, but we are not making full use of it. To this end we are currently evaluating whether to repurpose a building on Furnival Street to create a ‘digital hub’. This building, formerly the Sheffield headquarters of semiconductor firm Jennic and then NXP, was acquired by the university a few years ago. It’s in an ideal location to serve our students and potentially provide the opportunity to use the building to do something new. The building is across the road from the University’s Cantor Building, which houses, among many things, the Department of Computing; the Department of Media, Arts and Communications; the Cultural Communication and Computing Research Institute (C3RI); cybersecurity research centre CENTRIC; the University’s world-class videogames development labs and digital media production facilities. What we would like to do with the new building is provide a gateway or ‘hub’ for better connectivity with our community. It’s been envisaged that we would have a co-working and collaborative space, office space and labs. We hope to provide incubation and acceleration ​and other spaces to leverage these assets and more fluidly connect them with the outside world. This project is still in the evaluation stage, with firm decisions likely to be made sometime this Summer. If you have any questions or want to get involved in any of these initiatives, please contact the individuals responsible. And finally a huge thanks to the round table participants and everyone who came to take part, and especially to Creative Sheffield for collaborating with us to produce and host the event.